NC State provides innovators with a range of programs and services to develop, protect, market and commercialize inventions developed at the university through the licensing of intellectual property or the launch of new companies based on university innovations. In the last five years, NC State’s Office of Research Commercialization has received more than 1,000 new invention disclosures, executed over 750 commercialization agreements, issued over 320 patents, and helped facilitate the launch of 135 startup companies who add $1.2 billion annually to North Carolina’s economy. Among universities without medical schools, NC State consistently ranks among the top 10 for key technology transfer metrics: Licenses and Options Executed (2nd), Invention Disclosures (5th) and Startups launched (4th). Among all research universities, NC State ranks No. 25 for technology transfer. An example of NC State’s research impact can be seen in the recent news about 2015 NC State spinout Locus Biosciences, Inc. Earlier this month, Locus entered into an exclusive collaboration and licensing agreement with Janssen Pharmaceuticals, Inc. The agreement, facilitated by Johnson & Johnson Innovation, includes an initial investment of $20 million and is potentially worth up to $818 million. The partnership is focused on the development and manufacturing of CRISPR-Cas3-enhanced bacteriophage products targeting two key bacterial pathogens of the respiratory tract and other organ systems. After the deal, Locus will retain all rights to the technology and its application to other pathogens. 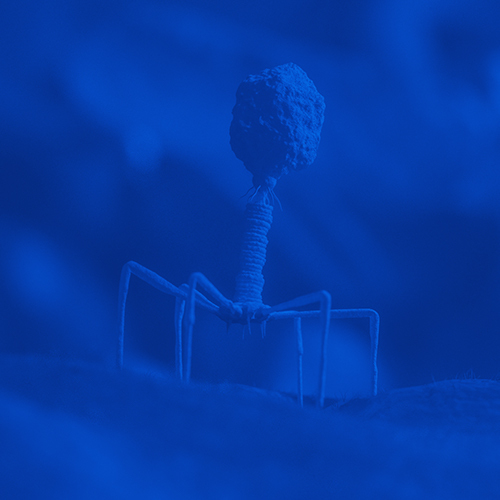 Rendering of Locus bacteriophage technology. Image provided by Locus Biosciences, Inc.
“During the early days of Locus’s formation, NC State Research Commercialization worked closely with the team to help solidify intellectual property protection and the freedom to operate around the university’s CRISPR inventions,” said Wade Fulghum, interim executive director for the Office of Research Commercialization. Today, NC State has several issued patents related to the CRISPR Cas3 technology licensed exclusively to Locus Biosciences for global use. The university also worked with Locus to identify intellectual property and funding opportunities available through NC State’s network. CRISPR research at NC State was instrumental in the founding of Locus under the leadership of the company’s CEO Paul Garofolo and included two scientific founders from NC State, Dr. Rodolphe Barrangou, a renowned Todd R. Klaenhammer Distinguished Professor in Probiotics Research, and Dr. Chase Biesel. NC State Research Commercialization Director of Licensing Kultaran Chohan, Ph.D., worked with NC State researchers and Locus Biosciences to secure foundational CRISPR Cas3 patents. “CRISPR is a great example of the groundbreaking research being done at NC State. As you would expect, inventions and technologies developed at a university are generally at an early stage and require further development and testing before they can be made available in the marketplace. Our partners at Locus Biosciences, under the leadership of CEO Paul Garafolo, have built an incredible technology and company based on CRISPR Cas3 intellectual property,” Kultaran explained. Locus is the world leader in CRISPR-engineered phage therapeutics — a groundbreaking way to treat infections stemming from bacteria found nearly everywhere within the human body. The Type I CRISPR-Cas3 patented technology degrades the DNA of target bacteria cells and quickly destroys them, removing unwanted bacteria from the human body while leaving the good bacteria unaffected. If proven safe and effective in clinical trials, these products could provide a turning point in the global battle against antibiotic-resistant infections and other microbiome dysbiosis-related conditions. The Office of Research Commercialization understands that startups need support and flexibility in the early days and that if you give them the opportunity to run they can achieve great things.